The concept of standardization is highly sought after throughout the business world. The tangible and intangible benefits it offers both producers & consumers is too great to ignore; and it is these benefits that inspired 25 engineers from around the world create the International Organization for Standardization, or ISO, in London, England. Since its inception in 1947, ISO has published over 19,500 International Standards spanning various industries, and improving the world in the process. – The establishment of a framework for continual improvement and customer satisfaction. – The ability to provide technical support for regulators. – The transferring of good managerial practices. Through careful organization and structuring, ISO 9001:2015 seeks to build and sustain customer confidence through the use of well-managed processes, resources, and documentation. The ISO QMS model also results in the continual improvement of products and services a business offers its customers. Put another way, ISO compels businesses, such as ours, to not only establish, but continually maintain high standards for itself… Your business benefits as a result. Again, our commitment to maintain the high standards set forth by ISO benefits you, our customer. This is realized through the myriad of tests and certifications we offer to personnel throughout the piping industry. 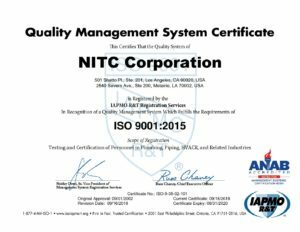 Journey Level and Master Level Plumbers and assorted city, county & state governmental agencies are but some groups who benefit as a result of ISO 9001:2015. Additionally, Plumbers, Pipefitters, HVACR Technicians, and Fire Protection & Safety Systems Technicians all benefit from NITC’s commitment to offering various industry professionals top quality test preparation, administration, and certification. In fact, we maintain two offices to better serve you… Our national headquarters in Los Angeles, CA manages examinations and certifications, while our Metairie, LA location provides technical information and assistance to those involved with medical gas, brazing, or welding. Help your business exceed customer expectations for excellence by contacting NITC today at (877) 457-6482 to learn more about how we help the construction industry, as well as the general public, through education.